While serving in office, President Franklin D. Roosevelt inventoried the vast quantities of papers and other materials he and his staff had accumulated. Up to that time, many Presidential papers and records had either been lost, destroyed, sold for profit, or ruined by poor storage conditions. President Roosevelt sought a viable solution. Advised by a number of noted historians and scholars, he established a public repository to preserve the evidence of the Presidency for future generations. Beginning a tradition that continues to this day, Roosevelt raised funds from private resources for the new facility and then designated its operation by the United States government through the National Archives. One of the Presidential Libraries which are the legacy of FDR's vision, is the Dwight David Eisenhower Presidential Library and Museum, located in Abilene, Kansas. This facility is part of the Presidential Libraries System administered by the National Archives and Records Administration (NARA). Abilene, Kansas was selected as the site for the Eisenhower Presidential Library and Museum, even though Dwight David Eisenhower was not born in Abilene, Kansas, nor did he die there. During his lifetime, however, he credited the years he spent in the central Kansas town as among the most important of his life. The Eisenhower Presidential Library and Museum grounds are comprised of several structures. The two most prominent are the Museum and the Library, which are housed separately. Building exteriors consist of Kansas limestone with landscaping using blue stem grass. Marble interior walls are Bookmatched Loreda Chiaro, Italy. Floors are Roman travertine trimmed with Breche d'Alep & Rouge Fleuri marble from France. The Museum was built by the Eisenhower Foundation, with funds raised through public gifts, and is constructed of Kansas limestone. Originally dedicated on Veterans Day in 1954, the Museum was designed to house the materials and objects related to Dwight D. Eisenhower's life. It contains over 30,000-square feet of gallery space, with exhibits showing not only the fine art objects collected by and given to Eisenhower, but also the story of his careers as military leader and President of the United States. The Library provides a place for scholars to come to work with the historical materials housed there. One of the most interesting aspects of the Library is its Oral History Collection. This Collection has been built upon two major components: (1) the Eisenhower Presidential Library's own interviews, and (2) approximately 500 transcripts acquired through a cooperative arrangement with Columbia University's Oral History Project. A third and smaller component consists of a number of oral history interviews donated to the Library by various institutions and individuals. 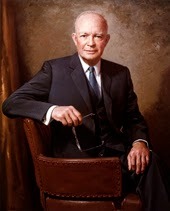 The list of oral history transcripts gives the names of the persons interviewed, and also the principal positions held by them during the Eisenhower administration or their personal relationship to Dwight D. Eisenhower as documented by their interviews. The following excerpt is from Eisenhower's speech given at the time of the ground-breaking of the Library on October 13, 1959: "When this library is filled with documents, and scholars come here to probe into some of the facts of the past half century, I hope that they, as we today, are concerned primarily with the ideals, principles, and trends that provide guides to a free, rich, peaceful future in which all peoples can achieve ever-rising levels of human well-being."